Transport multiple meals at once with our wide range of top quality meal delivery carts. 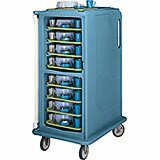 Designed to keep hot foods hot and cold foods cold, these carts are widely used in hospitals, hotels, guest rooms, and other institutions where holding and delivering trays of hot and fresh meals are required. 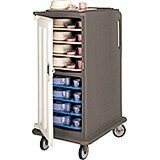 These meal delivery carts for tray service are designed with multiple, spacious shelves that will make your staff do the job in lesser trips. They make the delivery process quicker, as a result of which, the food quality is maintained. These carts for meal delivery are equipped with noise-less casters to create absolutely no disturbance to the guests or patients. Available in a wide range of configurations, we offer a selection of meal delivery carts in 1, 2, or 3-door designs to fit your needs. 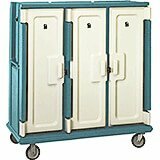 Low profile units have durable, insulated, molded polyethylene doors that match the cart color. These meal delivery carts hold 14" x 18" trays, 2 compartments per cart, each compartment hold 10 trays. Low profile units have durable, insulated, molded polyethylene doors that match the cart color. These meal delivery carts hold 15" x 20" trays, 2 compartments per cart, each compartment hold 10 trays. Tall profile units have, non-insulated ABS doors that are lightweight and durable. These meal delivery carts hold 14" x 18" trays, 16 tray capacity, 1 door. Tall profile units have, non-insulated ABS doors that are lightweight and durable. These meal delivery carts hold 14" x 18" trays, 30 tray capacity, 3 doors. Tall profile units have, non-insulated ABS doors that are lightweight and durable. 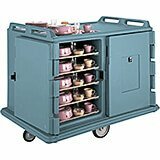 These meal delivery carts hold 15" x 20" trays, 16 tray capacity, 1 door. 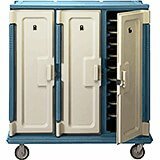 Tall profile units have, non-insulated ABS doors that are lightweight and durable. These meal delivery carts hold 15" x 20" trays, 30 tray capacity, 3 doors. 48-1/2" x 32-1/2" x 44"
55-1/8" x 38" x 43-1/4"
60" x 29-1/4" x 63-5/8"
30-5/8" x 39-1/8" x 58-1/8"